Here, at present day 1304 Calhoun Avenue, Charles E. Pabst built “Pecan Nurseries”, a one story, wood-frame cottage with a side gable roof. The facade features a four bay, full width undercut gallery supported by five square posts. Two transomed entrances complete the symmetrical facade. The Pabst cottage was probably completed in 1882. It was built with eight-inch wide floor joists and double flooring. In August 1944, Charles E. Fink (1898-1956) and spouse Cecelia Buechler Fink (1909-1999) acquired the old Pabst property on Calhoun. A concrete block addition was added to the rear of the house in 1947 following the September Storm. As of October 1993, the house had retained it’s original electric wiring which was of pre-WW I vintage. Initially Charles E. Pabst made his livelihood as a carpenter and laborer. It is believed that he helped build the First Presbyterian Church on Ocean Avenue in 1886, where he played the organ. In 1883, he established “Charles E. Pabst & Sons”, a nursery business situated on Calhoun Avenue. Mr. Pabst became interested in pecans about 1892. After years of experimentation, he became the first man to make a successful graft on a pecan tree. The earliest attempt to grow pecans at Ocean Springs was made by another German immigrant, Ferdinand W. Illing (1838-1884). Illing planted trees on his Washington Avenue and Porter property, but lost interest. He built the Illing House, a successful hotel business in 1870. Colonel W.R. Stuart (1820-1894), a retired sugar and cotton broker from New Orleans also contributed to the early development of pecans in the area. Propagator of the celebrated Russell & Pabst Pecans and other varieties. The choicest variety of seedless Japanese persimmon the largest in the market. 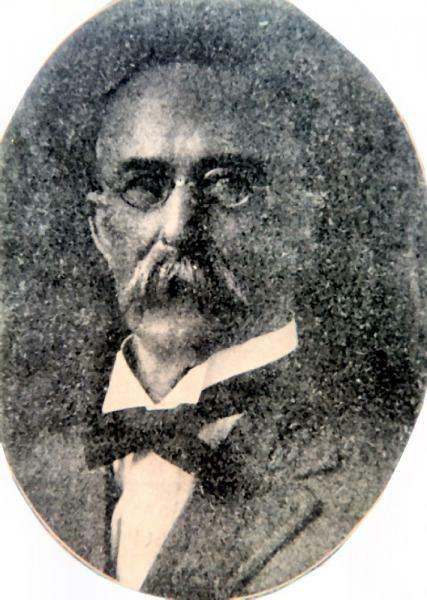 Charles E. Pabst is credited with establishing the first pecan nursery in Mississippi, and is recognized as the father of the paper shell pecan industry. In 1896, Pabst started the Ocean Springs Pecan Nursery with his sons in the W/2 of the SW/4 of Section 26, T7S-R8W. This historic plantation was bounded on the north by the L&N Railroad, on the east by Hanshaw Road, on the south by Davis Bayou, and was entered from Pabst Road on the west. In March 1916, Charles E. Pabst advertised his business in The Ocean Springs News, as follows. The Ocean Springs News, March 9, 1916, p. 2. Many of C.E. Pabst's earlier agricultural experiments and grafts were probably made at his Calhoun Avenue location. There are still some large, old, grafted pecan trees on the property. In 1881, the Pabsts had their first child, George Carl Pabst (1881-1949). They were also blessed with more two sons, Ernest G. Pabst (1884-1927) and William F. Pabst (1886-1940). Charles E. Pabst was active in the social and political activity at Ocean Springs. He served as Alderman Ward 3 (1895-1896), and was president of the Farmers and Merchants Bank in 1913. Ernest Ghem Pabst (1884-1927) managed an ice factory at Ocean Springs. In July 1916, he married a widow, Escambia McClure Baker (1880-1947). She had married Orion A. Baker (1869-1908) in 1896. The Baker children were: Frank E. Baker (1897-1958), Richard M. Baker (1900-1961), Orion S. Baker (1898-1951), Eleanor Mae Baker Davis (1903-1947), and Morris McClure "Babe" Baker (1907-1994). Ernest Pabst died in an accident at the ice factory on Jackson Avenue were he was electrocuted on July 25, 1927. He was serving as Alderman from Ward 3 at the time. William Frederick Pabst (1886-1940) became a linotype operator. Before 1922, he left Ocean Springs for New Orleans. In 1928, Pabst was employed with The Cordelle Dispatch at Cordelle, Georgia. He later relocated to Norfolk, Virginia. W.F. Pabst married Bertie Mae Galle (1909-1944), the daughter of Frank E. Galle (1877-1934) and Jessie Bird Galle (1880-1942). They had no children. Mr. Pabst served in the European theater during WWI. He returned to Ocean Springs and died at the VA Hospital in Gulfport. Mrs. Pabst was employed with a large jewelry firm at Norfolk, and returned there after her husband's demise. During WWI, relatives of Charles Pabst with the family name Beck, who resided at Hanover, Germany, wrote him asking for assistance as they were devastated by the turmoil. Shortly before his demise, Charles E. Pabst married Hoosier, Maude R. Wright, (b. 1887), at Biloxi on March 26, 1919. He expired on June 3, 1920. Pabst’s corporal remains were also interred in the Evergreen Cemetery. Thomas Ewing Dabney, Ocean Springs: The Land Where Dreams Come True, (reprinted by 1699 Historical Committee: Ocean Springs-1974), pp. 22-23. Regina Hines Ellison, Ocean Springs, 1892, (2nd Edition), (Lewis Printing Services: Pascagoula-1991), p. 77, 81. C.E. Schmidt, Ocean Springs French Beachhead, (Lewis Printing Services: Pascagoula-1972), p. 50, p. 127, p. 133, and p. 135. The History of Jackson County, Mississippi, "Pecans", (Jackson County Genealogical Society: Pascagoula-1989), pp. 19-20. The Daily Herald, "Pabst-Wright Nuptials", March 27, 1919, p. 4. The Daily Herald, "C.E. Pabst, Expert Pecan Culture, Dies", June 7, 1920, p. 6. The Daily Herald, "Ernest Pabst Obit", July 27, 1927, p. 2. The Daily Herald, "Man Killed At Ocean Springs", September 22, 1934, p. 1. The Daily Herald, "Three Burned To Death in 3-Way Crash At Biloxi", July 31, 1947, p. 1. The Daily Herald, “Know Your Coast”, ‘The Paper Shell Pecan Originated in Ocean Springs’, 1957. The Jackson County Times, “Another Good Citizen Passes Away Thursday”, June 5, 1920. The Jackson County Times, “Pabst Pecan Farm Sold To Chicago Man”, November 24, 1923. The Jackson County Times, “Pabst Pecan Farm Has New Owner”, March 17, 1928. The Jackson County Times, “Local and Personal”, September 22, 1928. The Jackson County Times, "Willie F. Pabst", November 2, 1940, p. 2. The Jackson County Times, “Bertie Mae Pabst”, February 26, 1944, p. 1. The Jackson County Times, “Mrs. Mary E. Pabst Succumbs Tuesday Night”, February 4, 1947. The Ocean Springs News, “Local News”, August 6, 1910. The Ocean Springs News, “Charles E. Pabst & Sons”-(advertisement), November 4, 1915. The Ocean Springs News, “Mrs. C.E. Pabst”, March 9, 1916. The Sun Herald,"W.R. Esche", November 20, 2000. The Sun Herald,"E. Berniece Pabst Mitchell Esche", January 13, 2011.